VAR Diverter Valves consist of a cast aluminium casing and cover, an inlet and two outlets. The rotating internal drum optionally closes one of two outlets which are connected with pneumatic conveying ducts. Rotation of the internal drum is activated by a pneumatic actuator. Perfect sealing is guaranteed by internal, pneumatically inflatable seals. 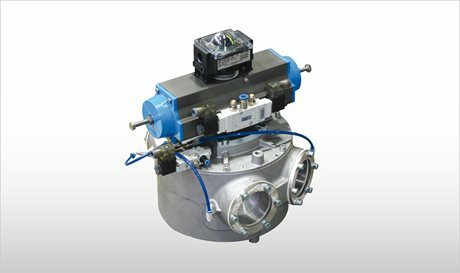 VAR Diverter Valves are suitable for diverting or converting any type of powdery or granular material. Commutation of the tubular exit and diversion of the material flow from one duct to another is obtained by a pneumatic actuator which activates the rotating inner drum.